A kazoo is a type of instrument known as a mirliton, which uses a resonating membrane to amplify sound. It belongs in the percussion family of instruments and can be made in a number of ways. Derived from the ancient African mirliton, the kazoo was first manufactured during the 1800s. Today, it is primarily a plastic, toy instrument, which is fun and relatively easy to play. The primary method of modern manufacture involves injection molding with subsequent assembly of the various pieces. A kazoo is a wind instrument unlike conventional brass and woodwind instruments. It is typically an open-ended, short tube, which is tapered at one end. Near the wider, front of the instrument there is another opening on top called the turret section, which houses a thin, resonating membrane. It has no valves or buttons typical of other instruments. In addition to these structural differences, a kazoo is also played different than conventional instruments. In brass instruments, the buzzing sound of the lips is amplified to produce the notes. In wood-wind instruments, musical notes are created by the vibration of the reed. The kazoo relies on the voice of the musician to produce the sound. When a musician plays a kazoo, he hums into it and that causes the thin film to vibrate. This vibration changes with the sound of the voice giving it the buzzing quality, which is unique to the kazoo. The kazoo was most likely derived from an African instrument called the mirliton. Just like the kazoo, the mirliton has an internal membrane that creates a buzzing sound when it is played. African tribes used it as a voice disguiser during religious ceremonies. In America, a modified version of the mirliton was a popular African-American folk instrument during the 1800s. Kazoos are available in a variety of shapes and sizes. The body of the instrument can be made from numerous materials including plastic, metal, wood, and glass. Of these materials, plastic is most commonly used. Plastics are high molecular weight polymers produced through various chemical reactions. Most kazoos are made from thermoplastics, which are more rigid and durable. Different types of plastics used to make the body of a kazoo include polypropylene and high-density polyethylene (HDPE). To make these materials easier to work with, fillers, which change the properties of the plastic, are often added. These fillers can make the plastic more rigid, more light-weight, and make them less prone to breaking. For decorative purposes, colorants may be added to the plastic to change the appearance of the kazoo. Typically, the plastic is supplied to the kazoo manufacturers as pellets complete with all the filler and colorants already added. Although plastic is the most often used material, higher priced kazoos are manufactured with metal. These kazoos are usually stainless steel, but silver and gold kazoos have also been produced. While wood and glass kazoos were popular during the late 1800s, they are rarely made today due to their relatively higher cost and difficulty of manufacture. The resonating membrane is made from materials, which have special characteristics. The materials are thin and flexible to help maximize resonance. They are also resistant to tearing. Wax paper was the material of choice when the first kazoos were made. However, wax paper proved to be unreliable because it often breaks over time. Currently, an advanced silicone plastic is used. The most critical part in the kazoo manufacturing process is designing the mold. A mold is a cavity carved into steel. When liquid plastic or molten metal is poured into the mold, it takes on the mold's shape when it cools. During manufacture, the mold cavity is highly polished because any flaw on the surface will be reproduced on the plastic. A two piece mold is used to make kazoo parts. The mold pieces are joined together to form the cavity in which the plastic part is formed and opened to release it. Special release agents help make the parts easier to remove. Also, a slight taper in the mold design aids in removal. Steel molds are highly precise and can produce exact parts each time. When molds are designed however, they must be made slightly larger to compensate for the fact that the plastic part shrinks as it cools. The typical kazoo is composed of three parts including the main body, the turret section, and a resonating membrane. The kazoo's main body is responsible for providing a playing surface and amplifying the sound. While the main body is typically made in the shape of a tapered tube, it can actually take on almost any shape as long as it is opened on both ends. There are kazoos shaped like bugles, while others look like trumpets or saxophones. The turret section houses the resonating membrane. This section is typically a round piece, which fits into a hole on the main body. The resonating membrane is the heart of the kazoo. It is a thin film, which vibrates as sound passes by. The vibration results in a buzz, which changes the sound emitted from the instrument. The manufacture of kazoos has changed very little since the early 1900s. They are still made by a step by step procedure which involves injection molding of the pieces, fitting the pieces together, decorating the kazoo, and putting the finished product in packaging. The major change has been in the type of materials that are used. 1 At the start of kazoo manufacture, plastic pellets are transformed into kazoo parts via injection molding. The pellets are first put into the hopper of the injection-molding machine. They pass through a hydraulically controlled screw and are melted. As the screw turns, the melted plastic is funneled through a nozzle and physically injected into the mold. Before injection, the two halves of the mold are brought together to form a cavity which has the shape of the kazoo part. Inside the mold, the plastic is held under pressure for a set amount of time and then allowed to cool. As it cools, the plastic inside hardens. After a short while, the mold halves are opened and the kazoo part is pushed out. The mold then closes again and the process begins again. Metal kazoos are stamped from metal sheets and then the two halves are assembled together. 2 After the kazoo parts are ejected from the mold, they are manually inspected to ensure that no significantly damaged parts are used. The damaged parts are set aside to be remelted and reformed into new kazoo parts. Plastic pellets are transformed into kazoo parts via injection molding. The pellets are first put into the hopper of the injection molding machine. They pass through a hydraulically controlled screw and are melted. As the screw turns, the melted plastic is funneled through a nozzle and physically injected into the mold. Before injection, the two halves of the mold are brought together to form a cavity which has the shape of the kazoo. 3 The kazoo parts are then transported to an assembly line. In this phase of production, the resonating membrane is first glued to the turret section. This membrane may be supplied to the manufacturer as a pre-cut film or as a large, continuous sheet. After the turret section and membrane are attached, they can be snapped or glued onto the appropriate hole of the main body. At this point, the kazoo is in working order. 4 Since kazoos are often sold as toys or advertising specialty items, they are typically decorated with a logo or design. Decoration is applied by either direct labeling or silk screening. Direct labeling involves simply sticking a label on the body of the kazoo. Silk screening is a process, which uses a machine to print colored ink right on the kazoo. The machine consists of a series of rollers and plates, which are dipped in ink. 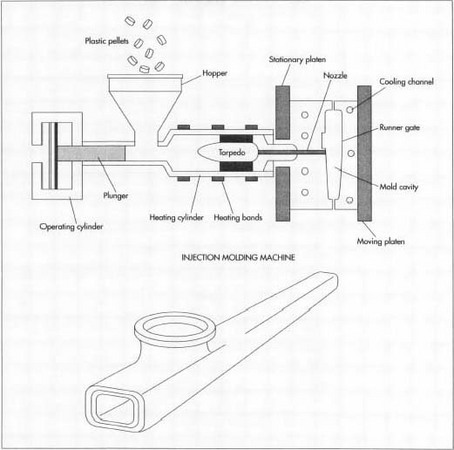 When a kazoo is passed through the machine, the ink is transferred from the plates to the body of the kazoo. The ink is specially formulated so that it dries before the kazoo exits the machine. 5 After all the decorations have been set, the kazoos are put in their final packaging. This can be a small box with an instruction booklet included or a plastic blister pack with a cardboard backing. The package serves the dual purpose of protecting the kazoo from damage caused by shipping and advertising the product. The kazoo packages are put into cases and transferred to a pallet. The pallets are then loaded on trucks and the kazoos are shipped to local distributors. The quality of the kazoo parts are checked during each phase of manufacture. Since thousands of parts are made daily, complete inspection is very difficult. Consequently, line inspectors may randomly check the plastic parts at fixed time intervals and check to ensure they meet size, shape, and consistency specifications. This sampling method gives a good indication of the quality of the overall kazoo production run. Visual inspection is the primary test method. Things that are checked for include deformed parts, improperly fitted parts, and inappropriate labeling. In addition to these checks, more rigorous measurements can also be performed. Measuring equipment is used to check the length, width and thickness of each part. Typically, devices such as a vernier caliper, a micrometer, or a microscope are used. Each of these differ in accuracy and application. The future improvements in kazoo manufacture will focus on improving quality, growing sales, and increasing output. To improve quality, future kazoos will be made with better plastics. For example the resonating film will be more durable and less prone to breakage. To grow sales, manufacturers will likely develop kazoos that have unique designs. For example, they may design a kazoo to tie in with a popular character from an animated movie. In manufacturing, improvements may be made which would reduce the number of parts required to make a kazoo. One process that has potential application in this area is the use of ultraviolet (UV) curable plastics. These plastics rely on UV light to solidify and can be used to make parts without the use of injection molding. Other improvements will focus making the production process more automated and increasing production speeds. Seymour, R. and C. Carraher. Polymer Chemistry. New York: Marcel Dekker Inc., 1992. Chabot, J. F. The Development of Plastics Processing Machinery and Methods. Brook-field, IL: Society of Plastics Engineers, 1992. Stewart, Barbara. How to Kazoo. Workman Publishing Co., 1983. Berghash, R. and D. Jachimowicz. U.S. Patent #4832653. The Original American Kazoo Company, 8703 South Main Street, Eden, New York 14057. (716)992-3960.